I just got home from school and opened my door to find my roommate drunk passed out on the couch from last night, look down and see a black box and get all excited start jumping off the walls! So anyways.. half of my suspension upgrade is here, the coilovers! Waiting on the struts to come in and then its time for the drop! Re: UPS is my friend! nice nice nice! What kind of drop are they gonna give you? What did you get for struts? i love UPS when they bring me stuff. they give my dog a treat too so shes happy. What kind of drop are they gonna give you? 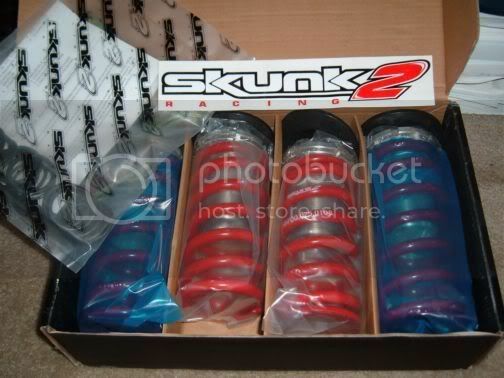 Sweet coils man, hope they work well for ya. how long til you have your struts? what did you buy? hope you're gonna tell us that you are pairing these with KYB AGX's FTW!! Last edited by 99PreludeSh; 08-16-2008 at 11:40 AM.